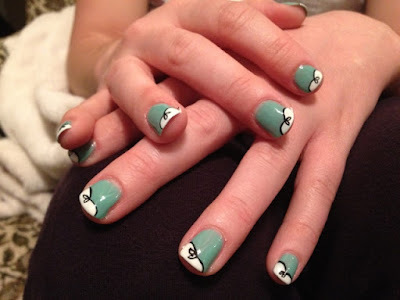 Lately I have been on a nail art kick, as you can see from my new Nail Art tab on my blog. For my birthday, my friend Audra gave me a bag full of nail polishes! She gave me a bunch of fun colors, and two nail stripe bottles- that are just awesome and allow me to be more creative with stripes and like in the image below, I can make bows, etc. I was totally stoked and of course had to paint my nails almost immediately. I tried out a zebra stripe look, (which I will show you in another post) and then I tried this manicure that I found on Pinterest. It was from a tutorial featured on thebeautydepartment.com. It is actually a pretty sweet site, put on by Lauren Conrad and a few other ladies. It has a bunch of hair tutorials, nail tutorials, and just really great fashion sort of stuff. I love the site. Anyways, thanks to their tutorial, I gave this manicure a try on my sister's nails. It took a little while, with all the colors and layers, etc. But I think the result was pretty cute!